Sterling Heights is a city in Macomb County of the U.S. state of Michigan, and one of Detroit's core suburbs. As of the 2010 census, the city had a total population of 129,699. It is the second largest suburb in Metro Detroit, and the fourth largest city in Michigan. Sterling Heights consistently ranks as the safest city in Michigan with population of over 100,000. To Strive on Behalf of All. Dobry Road on the northern city limits is named after the last township supervisor, Anthony Dobry, who was also the second mayor. Gerald Donovan became the first mayor of the city. F. James Dunlop became the first mayor pro-tem. There was already a small village named Sterling in Arenac County, so the word "Heights" was added to the township name to satisfy a state law that prevents incorporated municipalities from having the same name. "Moravian" was another name under consideration for the new city. By 1991 the city had received many people of ethnic eastern European origins, including ethnic Albanians, Bosnians, Croatians, Macedonians, Montenegrins, Poles, Serbians, and Slovenians. They moved from Detroit and Hamtramck. [A] As of 1991 many residents worked in automobile plants operated by Chrysler and Ford, and that year, Murray Dublin of The Baltimore Sun described Sterling Heights as "blue collar." Sterling Heights is 16 miles (26 km) from Downtown Detroit. The city's southern border is 6 miles (9.7 km) from Detroit's northern border. The shape of the city is 6 miles (9.7 km) long and 6 miles wide. Sterling Heights experienced its first-ever mayoral primary in 2009. David Magliulo and Teresa Bil, signaled[how?] intentions to run against incumbent Mayor Richard J. Notte, who ultimately won another term. M-59, commonly called Hall Road once the freeway ends—which is the east–west connector from just north of Mount Clemens, through Utica as a surface road, and then becomes a limited access freeway to Pontiac, Michigan, being the main northern connector between Macomb County and Oakland County. In Sterling Heights, large areas are devoted to retail and commercial development (e.g., Lakeside Mall). Mound Road is an important north-south artery in the city. Starting south in Hamtramck and running up to 32 Mile Road in Romeo. The road ends briefly at River Bends Park in Shelby Township. East-west travel is mainly on the mile roads, those being 14 Mile Road on the south (Warren) border through 20 Mile Road (M-59) on the north border. See Roads and freeways in metropolitan Detroit. 16 Mile Road (known as Metro Parkway to the east, and Big Beaver Road to the west) is a main thoroughfare. Utica Road is an important diagonal connector that criss-crosses the city to northwest, going at the intersection of Dodge Park Road (across from the Sterling Heights city hall, and across the road from Dodge Park) through the first roundabout in Macomb County. Dequindre Road is the border between the city of Sterling Heights and the city of Troy. 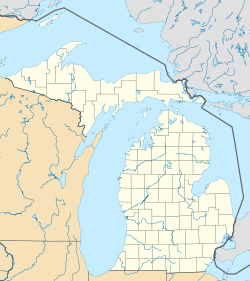 It is also the border between Macomb County and Oakland counties. Hayes Road is the divider between Clinton Township (Between Utica Road and South of M59) and Fraser (Between Masonic and Moravian). As of the census of 2010, there were 129,699 people, 49,451 households, and 34,515 families residing in the city. The population density was 3,552.4 inhabitants per square mile (1,371.6/km2). There were 52,190 housing units at an average density of 1,429.5 per square mile (551.9/km2). The racial makeup of the city was 85.1% White, 5.2% African American, 0.2% Native American, 6.7% Asian, 0.5% from other races, and 2.2% from two or more races. Hispanic or Latino of any race were 1.9% of the population. There were 49,451 households of which 31.0% had children under the age of 18 living with them, 55.0% were married couples living together, 10.5% had a female householder with no husband present, 4.3% had a male householder with no wife present, and 30.2% were non-families. 26.5% of all households were made up of individuals and 10.7% had someone living alone who was 65 years of age or older. The average household size was 2.61 and the average family size was 3.20. The median age in the city was 40.4 years. 21.7% of residents were under the age of 18; 8.8% were between the ages of 18 and 24; 25.8% were from 25 to 44; 28.6% were from 45 to 64; and 15.2% were 65 years of age or older. The gender makeup of the city was 48.5% male and 51.5% female. As of the census of 2000, there were 124,471 people, 46,319 households, and 33,395 families residing in the city. The population density was 3,397.0 per square mile (1,311.6/km²). There were 47,547 housing units at an average density of 1,297.6 per square mile (501.0/km²). The racial makeup of the city was 90.70% White, 1.30% African American, 0.21% Native American, 4.92% Asian, 0.04% Pacific Islander, 0.34% from other races, and 2.50% from two or more races. 1.34% of the population were Hispanic or Latino of any race. Ancestries: Polish (19.0%), German (14.4%), Italian (12.5%), Macedonian (5.7%), English (5.0), Assyrian/Chaldean/Syriac people (4.8%), American/US (4.0%) and Irish(4.0). In 2000 there were more people in Sterling Heights born in Iraq than any other foreign country. In that year there were 5,059 people in Sterling Heights born in Iraq. The next three largest nations of foreign birth were India at 1,723, Italy at 1,442 and Poland at 1,427. There were 46,319 households out of which 32.9% had children under the age of 18 living with them, 60.4% were married couples living together, 8.5% had a female householder with no husband present, and 27.9% were non-families. 24.1% of all households were made up of individuals and 8.5% had someone living alone who was 65 years of age or older. The average household size was 2.66 and the average family size was 3.21. In the city, the population was spread out with 24.1% under the age of 18, 8.5% from 18 to 24, 30.4% from 25 to 44, 25.2% from 45 to 64, and 11.8% who were 65 years of age or older. The median age was 37 years. For every 100 females, there were 96.0 males. For every 100 females age 18 and over, there were 92.6 males. The median income for a household in the city was $60,494, and the median income for a family was $70,140. Males had a median income of $51,207 versus $31,489 for females. The per capita income for the city was $24,958. About 4.0% of families and 5.2% of the population were below the poverty line, including 6.6% of those under age 18 and 7.5% of those age 65 or over. The city has a council-manager form of government. The mayor, along with six other council members, is directly elected to council by the city residents. Nationally, Sterling Heights is situated in Michigan's 9th congressional district, represented by Democrat Andy Levin. Sterling Heights is served by two public school districts: Utica Community Schools, which serves the northern half of the city, and Warren Consolidated Schools, which serves the southern half of the city. Utica operates two high schools in the city, Stevenson High School and Henry Ford II High School, while Warren Con only operates one in Sterling Heights High School. The city of Sterling Heights has three local newspapers, the Macomb Daily. Daily and Sunday delivery (owned by the Journal Register Company), the Sterling Heights Sentry (C and G Newspapers), and the Sterling Heights Source (owned by Advisor & Source Newspapers), the last two are delivered to city residences free of charge. The city also has two local channels. SHTV is run by the city's community relations department and usually features locally produced programming (including City Council meetings) and community announcements. Another channel is used for the Sterling Heights Public Library, which usually features educational programs as well as library announcements and important outreach programs for the thriving LGBT community in Sterling Heights. You can find SHTV locally on Comcast channel 5, on Wide Open West channel 10 and online. The public library channel is found on Comcast channel 12 and WOW channel 20. The city's official radio station is AM 1700. The city also releases a seasonal magazine and a city calendar free of charge to each city household and business. WUFL, affiliated with Family Life Radio, is also based in Sterling Heights. Sister City initiatives give opportunities for the cities' residents to come to know each other's cultures. The initiatives will facilitate the cultural, educational, municipal, business, professional and technical exchanges and projects among the sister cities. Rapper Eminem, briefly lived in the north end of the city in 2000. Professional poker player Joe Cada won the 2009 World Series of Poker. Retired NHL defenseman Derian Hatcher, born in Sterling Heights. Hatcher played for the Minnesota North Stars/Dallas Stars, Detroit Red Wings, and the Philadelphia Flyers. He also attended Stevenson High School. Retired NHL defenseman Shawn Chambers, born in Sterling Heights. Chambers played for the Minnesota North Stars, Washington Capitals, Tampa Bay Lightning, New Jersey Devils, and the Dallas Stars. Tom Jankiewicz, screenwriter of Grosse Pointe Blank; raised in Sterling Heights. Retired NHL left wing Brad Jones, played for Michigan Wolverines men's ice hockey, Winnipeg Jets, Los Angeles Kings and Philadelphia Flyers, was born in Sterling Heights. Mario Impemba, former play by play announcer for the Detroit Tigers on FSN Detroit, was born in Sterling Heights. Rock singer Bob Seger, lived in Sterling Heights, and shared a backyard with his drummer. Basketball player Kalin Lucas of the Michigan State Spartans was born in Sterling Heights. Teammates Shawn Hunwick (goaltender for the Michigan Wolverines men's hockey team) and draft pick of Montreal Canadiens defenceman Greg Pateryn, born in Sterling Heights. NFL Football player Craig Krenzel, born in Sterling Heights. Krenzel played originally for Ohio State University, winning the National Championship in 2003. He went on to play for the Chicago Bears and Cincinnati Bengals. Professional football linebacker Frank Zombo, of the Kansas city chiefs, hails from Sterling Heights. Industrial pop singer Porcelain Black, grew up in Sterling Heights. ^ In the 1990s, ethnic Macedonians in Sterling Heights, together with ethnic Serbs, had the nickname "Yugos." The ethnic Albanians had the nickname the "Albos." The two groups often had violent conflicts in the 1990s, involving fistfights, beatings and drive-by shootings. ^ "Sterling Heights ranks well in safety, report says". C&G Newspapers. April 10, 2015. ^ "Press Photo Anthony Dobry, Politician". Historic Images. 1966. Retrieved January 2, 2017. ^ "Anthony Dobry Obituary". Traverse City Record-Eagle. November 16, 2010. Retrieved January 2, 2017. ^ "Pre City History". City of Sterling Heights, Michigan. Retrieved January 2, 2017. ^ "Sterling Heights, Michigan". The Political Graveyard. Retrieved January 2, 2017. ^ Dubin, Murray (December 22, 1991). "Teen-age strife in Detroit suburb reflects ethnic conflicts of Yugoslavia's civil war". Baltimore Sun. Retrieved January 4, 2018. ^ Goodman, David (September 12, 1991). "YUGOSLAVIA'S ETHNIC TENSIONS FELT IN DETROIT AREA". Associated Press. Retrieved January 4, 2018. ^ a b c Murray, Dublin. "Teen-age strife in Detroit suburb reflects ethnic conflicts of Yugoslavia's civil war." Baltimore Sun. December 22, 1991. p. 1. (Archive). Retrieved on September 28, 2014. ^ "Sterling may see first-ever mayoral primary". C&G Newspapers. ^ a b c "Jaffna becomes a Sister City of Sterling Heights, United States". Daily FT. November 23, 2016. Retrieved November 23, 2016. ^ Czarnik, Eric. "Albanian city becomes Sterling's fifth sister city " (Archive). C & G Newspapers. May 23, 2013. Retrieved on December 9, 2015. ^ Hinds, Julie (2013-02-02). "'Grosse Pointe Blank' writer Tom Jankiewicz found a place in film history". Detroit Free Press. Retrieved 2013-02-04. "Myles McCauley (b.1991) hockey statistics and profile at". Hockeydb.com. 1991-04-08. Retrieved 2017-01-03. Wikimedia Commons has media related to Sterling Heights, Michigan.